Do Instacart and Hipsters Go Hand in Hand? Instacart has shifted the traditional grocery delivery model with a ​crowdsourced labor force of Personal Shoppers who shop for and deliver orders using their own transportation. This service naturally builds a trove of shopper data, which led to the 2015 Instacart "Foodie Awards"—insight on what customers really craved in 2014. So what are the demographics of these convenience-seeking customers? The "not hot" foods tend to the more staples and natural foods, categories of which Nielsen reports sales have gone up. My hypothesis has to do with the spread of Trader Joe's—from which Instacart currently does not deliver. I'm guessing as TJ's sets up new locations, more shoppers will do a weekly healthful food shopping spree there, often at lower cost. What falls into the "hot" column are foods that often get branded as HIPSTER (although one must observe a lack of pickles on the list). The kinds of hand-crafted, artisan yada yada foods we love to graze upon at food popups and the like. For retailers and food manufacturers, the data is thought-provoking, although I suggest perusing the trends with a grain of Himalayan sea salt, as we don't know the full story behind the purchase behavior. Tweet me your theories @susiewyshak. “The popularity of Brussels sprouts was unexpected,” said Instacart operations manager Bill Babeaux. 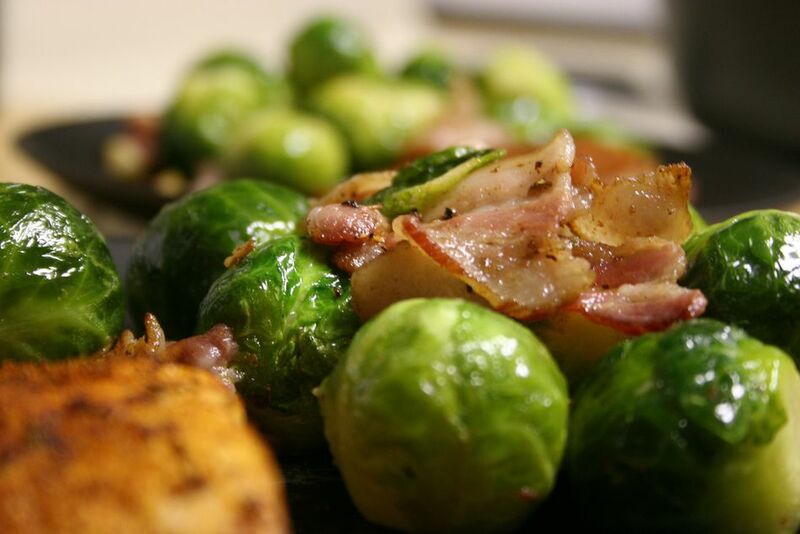 Restaurants perfected the Brussels sprouts side dish, and now we are addicted to garlicky Brussels sprouts doused in massive amounts of olive oil and Himalayan pink salt (trending up at Instacart). Whether or not this funky little vegetable is healthier than kale (which is trending downward), eating it makes us feel healthy. No matter how much we've roasted all but the most caramelized flavors from its being. I can see why it's trending. Instacart analysts wonder if Sriracha has reached its peak. How much Sriracha can the average American household consume? Not so much. No wonder Heinz and small batch / organic food crafters like Sosu Sauces are blending the hot sauce into frequently used sauces like ketchup. Would be interesting to see trend data on other types of hot sauce sales, as spicy condiments continue to be a smoking hot product category. No matter that we can't wake up and smell cold brew coffee. For the last few years entrepreneurs like Kickstarter-funded Secret Squirrel, High Brew Coffee and Chameleon have launched artfully designed, well made cold coffee beverages in beautiful cans and bottles. These brands have mastered packaging too, delivering form factors (the physical design) that makes sipping pleasurable beyond the coffee. It's really no wonder a category representing a quick, delicious jolt on the go is our new addiction. Aren't We All Searching For the Right Artisan Marshmallow? First, let's look at the use and non-use of the word "artisan." What first drew my attention in this popular Instacart search is that apparently the word "artisan" still holds meaning for some shoppers. Meaning, lots of customers actually typed in that word to fulfill their marshmallow dreams. If consumers still think of the oft-abused term "artisan" as indicating "hand made, small batch," then it's worth continuing to use "artisan" when describing your products—but only if you truly are making the marshmallows from scratch. And in moderation. You don't want shoppers (or the press) seeing your brand as out-of-touch. So rather than highlight "artisan" in your tagline/slogan, instead tell your story using descriptors such as "made from scratch using artisan methods much like old-time candy makers." Note my example does not use the phrase "handcrafted." Let's just say, factory-produced foods now use the word "crafted" which pretty much means "made." So what is an artisan marshmallow? Not the factory-made, campfire-stick variety in a bag. Nor the above-mentioned marshmallow merely dipped in chocolate and rolled in jimmies. Marshmallows are on the rise. 2015 is going to be THE year of the marshmallow if Kickstarter is any indication. Or rather the year of marshmallow combined with caramel in all sort of combinations that home candy makers (like me) and old-timers like See's Candies have mastered over the years. Tip: Use sugar syrup/glucose instead of corn syrup to fit into "Good Food" criteria and appeal to our favorite oxy-morons—healthy candy eaters. Healthy Food On the Outs? Healthy foods like quinoa, Greek yogurt, and coconut water are seeing less demand, along with—gasp—bacon! Could it be shoppers are going to Trader Joe's, not one of Instacart's retailers currently, for these food staples? Or could the data have shifted with a changing customer base? Maybe people experimented then shifted back to Trader or find a reason why shopping in-store for some occasional food needs makes sense. One thing is for sure: These foods trending downward on Instacart do not reflect general natural foods purchase trends, except perhaps quinoa. Intrigued? Learn what the Instacart trend means to brands and retailers. See the 2015 Instacart "Foodies" winners, and other trends Instacart uncovered in its research, see the infographic on the Instacart blog.